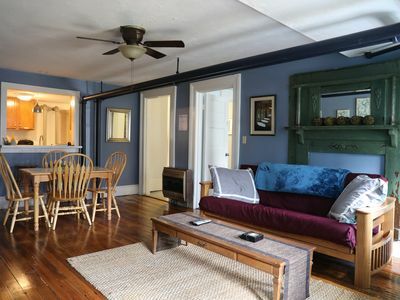 Cabin/cottage located just 7 miles to downtown Asheville, 10 miles to Asheville Regional airport, and also 7 miles to the gates of Biltmore Estate. 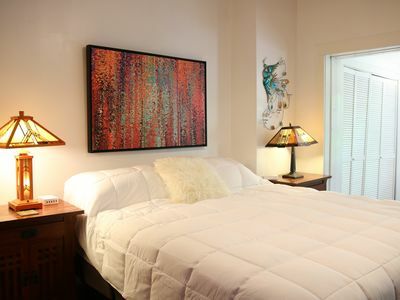 Convenient and within less than 2 miles of restaurants, shopping and more. 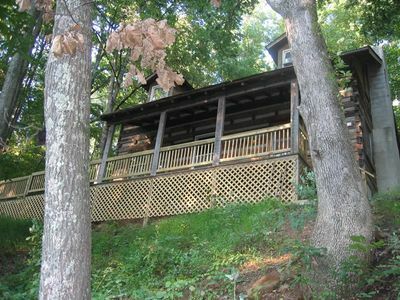 Wow, cabin seclusion yet close to downtown Asheville! 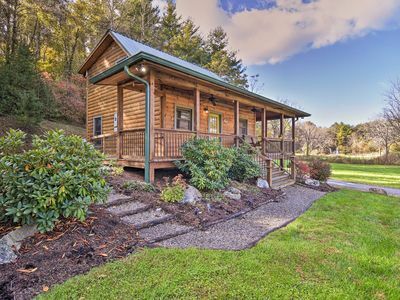 This luxurious cabin is a 1-Bedroom retreat, nestled within the confines of Asheville Luxury Cabins, with nearby access to hiking, incredible views & more! 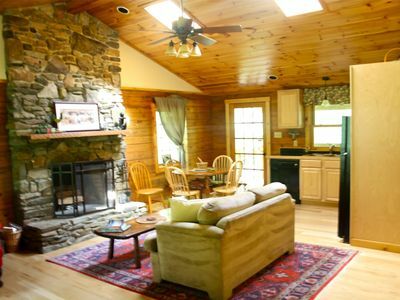 The Laurel, and all of the Asheville Luxury Cabins have become one of the coziest homes in our Yonder luxury portfolio, and has been a favorite retreat for guests for years! 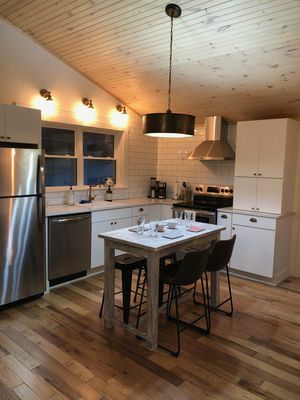 It is not surprising when you put a terrific cabin together with a private enclave, extensive outdoor space to walk, run, or ride a bike in our majestic mountains. 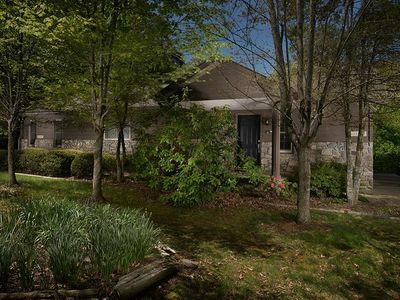 As for The Laurel...to begin and reiterate, this private cabin is located in an exclusive, private mountain enclave, Asheville Luxury Cabins, which is situated near downtown Asheville; just a short drive to just about everything. 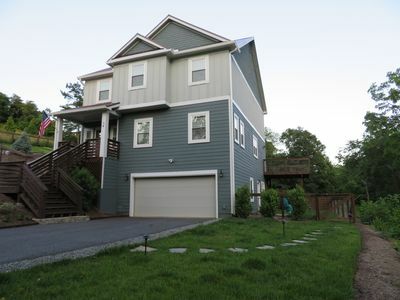 It is VERY easy to access the home, via only paved roads. 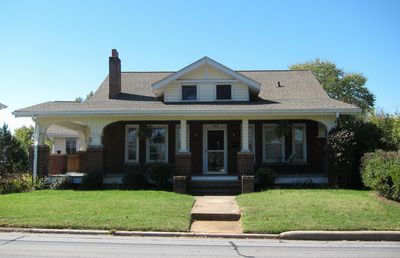 The home affords year round access, and does NOT require 4-wheel drive. 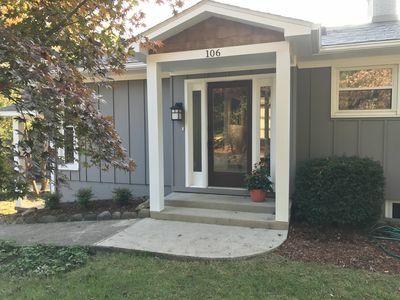 The home is situated in the south Asheville area, tucked into a very private cul-de-sac, affording safe places for kids to play & explore, adults to take a hike & ride bikes, and for everyone to relax & enjoy the world class attractions of the Asheville area. 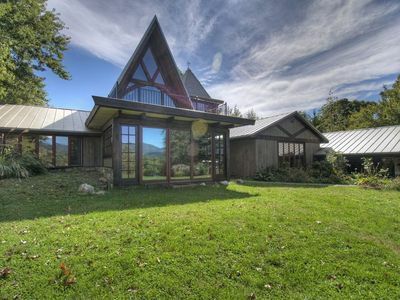 Get ready to feel relaxed and "right at home" in this cozy, contemporary mountain style retreat home. 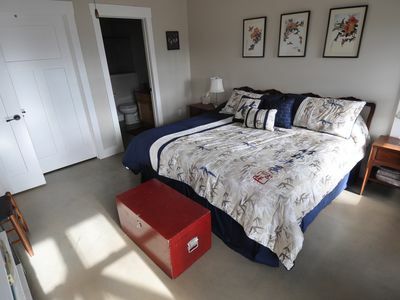 With forest views, high ceilings, vaulted spaces, wood, carpet and tile floors, you will immediately feel at home at The Laurel. 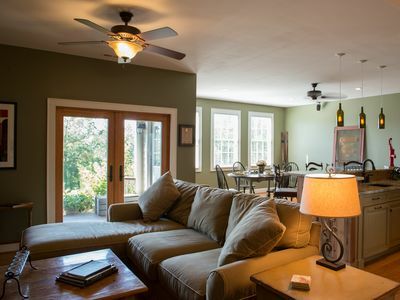 (That is of course if you can tear yourself away from the HOT TUB, or the relaxing forest views & soaking in spectacle of the Blue Ridge Mountains, & actually venture inside!) The great room, with stone fireplace, and fully equipped kitchen, is where everyone will want to gather to enjoy their time together inside the house. But, if you need some "alone time", there is plenty of space inside and out to find your own serenity. 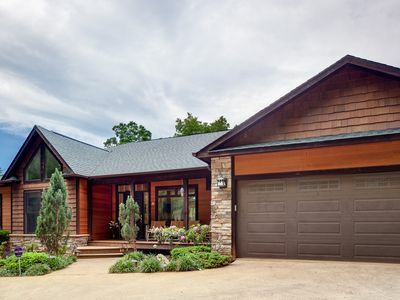 There are outside porches, decks, and patios for ultimate outdoor relaxation & private forest views. Kids & adults love getting out in and around the nearby outdoor recreation areas like Bent Creek, the French Broad Rover, and more. 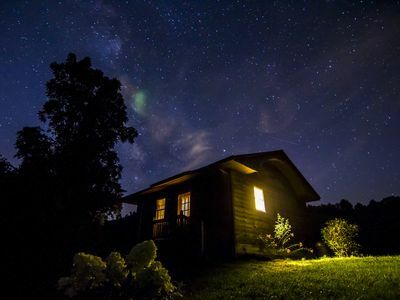 While everyone enjoys the cabin & amenities, you can pull up a chair and take in the relaxing privacy afforded by the forest view, observe the night as it fills with stars, and watch the fire flies come out to play in your backyard. Or, toast some s'mores and share stories, well into the star-filled nights at the expansive outdoor fire-pit. 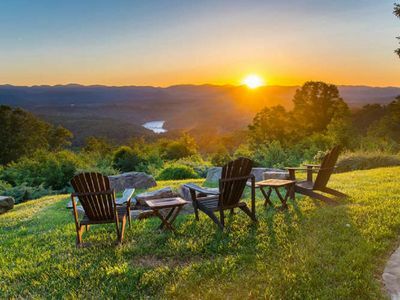 Take a seat in the hot tub and enjoy the sound of nature and the serenity in your own private paradise at the top of the world that is the Asheville mountains. 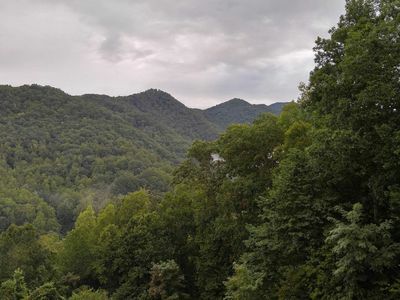 A number of nearby parks and recreation areas afford lots of acreage for nature walks and exploring, and other exercise on the mountains. Pets: The owners do allow dogs. Please let us know. There is a $200/pet non- refundable fee with a 2-dog max. limit. Please inquire for details regarding payment, the cancellation policy, military discounts, and trip insurance. 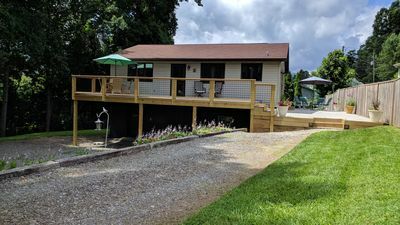 Quiet, private, only 10 minutes to downtown in the middle of 12 secluded acres! 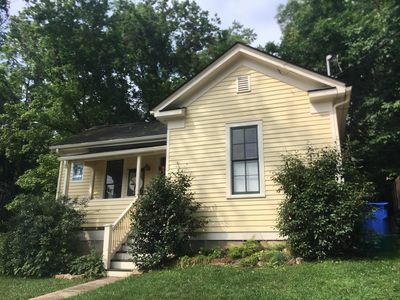 Rent Apt Close to Everything in Asheville $1600 Per Month!! 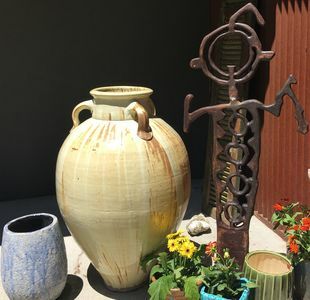 Pottery/Art-filled home, 2 acres, 2 mi to town, Mtn views, sleeps 12-16 pets OK!